The National Apprentice Challenge (NAC) took place on 21st and 22nd March 2015. The Bangor team, ‘Ignite’ comprised Daniel Taylor, Rhiannon Willmot, Shubhankar Gupta and Faris Alhussaini. NAC is the largest residential competition for creative and ambitious students in The UK. In teams of four, students from all backgrounds experienced a programme featuring exciting practical challenges which helped them to recognise their individual strengths and prepare them for the future. Participants had a chance to network with top employers and like-minded people with the potential to receive paid international internships based on their performance. The Flux team at the event: front left-right: Rhi Willmot, Dan Taylor, Michael Chapman and Kate Isherwood and behind them staff champion, Rob Laing and team member Shingai Manhambara.Hot on the heels of NAC came the FLUX 2015 competition on 23rd and 24th March. 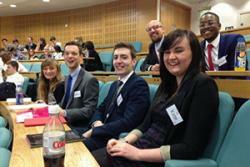 A Bangor team comprising Dan Taylor, Kate Isherwood, Rhi Willmot and Shingi Manhambara and Michael Chapman, competed against teams from across the UK in the competition at Lancaster University. Accompanying the team were Dr Caroline Bowman and Rob Laing. A number of top recruiters were involved including Santander and IBM which gave the students an opportunity to impress and gain vital employability skills. Teams were given a task to work on during the two days, being judged by a panel of industry experts on their pitch on the second day. The task required students coming up with a creative solution to a real life problem; in the case of the Bangor team it was around a wrist strap designed to monitor blood sugar levels in diabetic children. 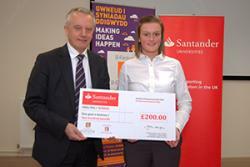 Carley Williams receives her prize from Bangor University Vice Chancellor, Professor John G Hughes.The Santander Entrepreneurial Awards on Friday 13th March saw five Bangor students pitching business ideas to a panel of judges including the Vice-Chancellor, Professor John Hughes. The winning undergraduate was Product Design student Carley Williams with her idea for a medical feeding peg and the winning postgraduate was Creative Studies and Media student Hernan Diazgranados whose idea was a karaoke-focused music streaming app. Each won £200 in the Bangor round of this competition and have submitted their ideas to the next stage of the competition for the UK finals where the prize is up to £20,000. Students earn BEA xp for taking part in all of these activities. These competitions were organised on behalf of Bangor University by B-Enterprising which received funding through the North West Wales Regional Hub. This Hub is part funded by the European Regional Development Fund and the Welsh Government to support delivery of the Youth Entrepreneurship Strategy (YES) for Wales.